Costs – Tulsa, Oklahoma has varied seasonal weather, which means its trees go through a lot. Keeping them regularly cared for is how they survive the harsh conditions. See what the cost is in the Tulsa area for tree trimming, pruning, cutting and removal of the tree or stump. FAQs – Since 1979, the city has been getting repopulated with trees. The work is not yet finished. See what you need to know about planting a tree in the city in terms of what trees handle the climate and conditions best, including fruit and shade trees, before going to the nursery. Services – With all of this information in your back pocket, it’s time to call a professional. We’ve got everyone in the field of tree maintenance and arbor care who works in Tulsa listed below for you to choose from below. How Much Do Tree Services Cost in Tulsa? 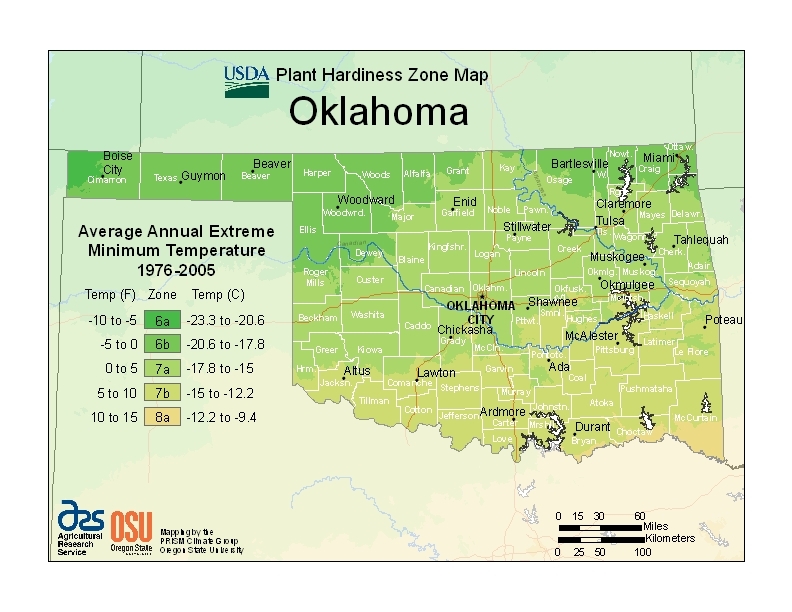 Tulsa, Oklahoma trees work through drought seasons and cold winter seasons of below freezing temperatures. During the spring and fall months though, they also need regular tree maintenance and care to stay strong and grow well. Find out what those costs are for trimming, pruning, cutting and removal of stumps and the whole tree when needed after a storm ahead of time in the Tulsa area with the statistics below. Tree removal in the Tulsa area will cost between $539 and $731, depending on the number of trees, complexity of the job, height, circumference and labor that goes into the removal. The average cost will be $635, but if the tree is close to the home or to power lines, there’s a good chance the tree service professional will have a higher quote for the special equipment and time that will go into taking the tree down without damages. In the same way, if the tree is particularly thinner and requires no special equipment, the estimate could be cheaper because it will take less time and hands to remove. Stump removal in the Tulsa area will depend on whether the stump is grinded or uprooted completely. Also tree service professionals will factor in type of wood, circumference of the trunk and location of the stump when quoting a price. If the stump is grinded, it will cost less because the stump will remain in the ground, probably around $100 to $200. If the stump is going to be completely uprooted, it will be closer to $400 or $500. Tree cutting, pruning and trimming will cost Tulsa tree owners between $350 and $450, depending on the types and state of the trees when the tree service professionals first come out to do the maintenance. If the trees have fewer branches and need less regular maintenance than trees with a lot of covering, then it will cost less. It’s important to schedule regular maintenance though, so the tree doesn’t get too overgrown and become a hassle. Speak with your arborist about the best plan and what the cost will be the long run. Since 1979, Tulsa has been working to repopulate the city with trees. Up With Trees, a non-profit organization, has grown 30,000 trees in the urban area. There are 500 sites in Tulsa that owe its trees to this organization, along with thousands of other trees that were given to organizations for planting by Up with Trees. The city still needs more trees in both its urban and residential areas to keep getting greener, so it’s important to know what grows best in the area and then go out and start planting more. The best time to remove a tree in Tulsa is during late winter before spring starts and trees start growing with renewed vigor with the sun’s rays. Of course, it will be important to be aware of any ice storms that may be passing through the area at this time, but otherwise this will be a good time to get the tree out of the ground before its roots get renewed by the soil getting nutrients from the sun and the melted snow. Oklahoma chose the redbud (Cercis canadensis) as the state tree in 1937. The heart-shaped leaves and reddish-pink blossoms growing against the dark bark of the tree illuminates the state during the spring. The tree thrives best in valleys, forests, and fields. It grows about 16 feet tall and lives about 10 years. 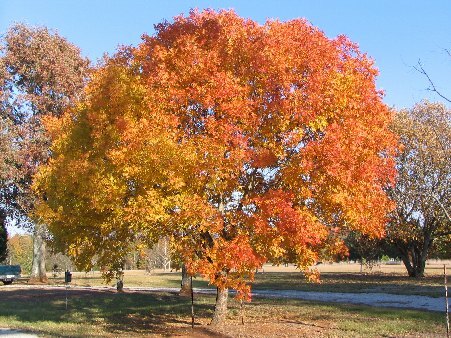 This tree can be seen in parts of Tulsa and can make for a good tree to grow in the backyard. Tulsa’s climate and soil conditions have the right needs to also grow apple and peach trees. Apples can handle the cold climate Oklahoma has during the fall and winter months, and peaches will grow in the spring and summer months. As long as Tulsa home growers don’t have soil that’s too moist, they should be able to harvest plenty of peaches when the time is right. Some trees have a harder time growing in Tulsa because of their vulnerability to diseases and pests in the area, as compared to other trees who have immunity. Deodar cedar (Cedrus deodara), for example, is a good tree to grow in Tulsa, but it is also susceptible to bagworms and spider mites. 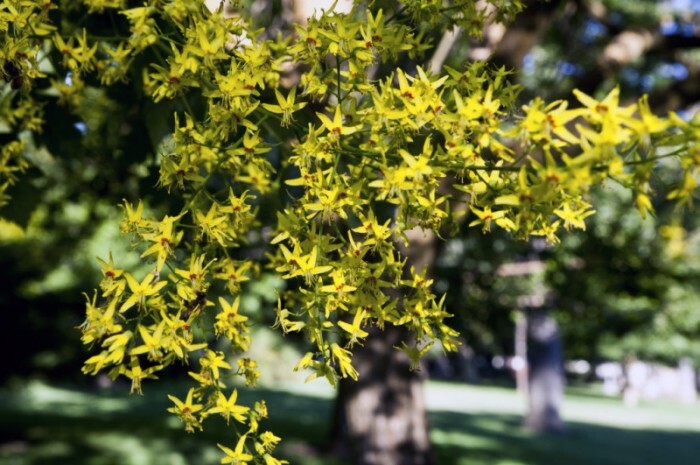 In the same way, trees like hackberry, honey locust, golden rain tree, and hawthorne are all trees that can grow in Tulsa but will deal with diseases and pests. Other common diseases that tree owners need to watch out for when planting their trees include Dutch elm disease, sudden oak death, and armillaria. Public Service Company of Oklahoma, the utility company for the state, recommends that trees be planted away from power lines according to their height. Small trees need to be 15 feet away from power lines, medium trees 30 feet away, and large trees 40 feet away. The utility company also comes around regularly and removes vegetation that lies near the power lines. So if you want to avoid a close trim of your trees, make sure they get regular maintenance and don’t plant them too close to the power lines. It’ll be a win-win situation for the power company and you in the long run.